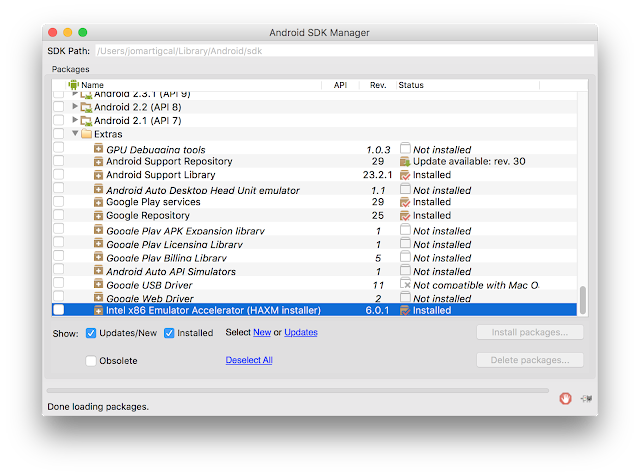 Have you tried creating an Android emulator and you've been prompted that it cannot launch because it requires hardware acceleration? When using an x86 system image for an Android Virtual Device (AVD), you should install HAXM (Hardware Accelerated Execution Manager). HAXM is a hardware-assisted virtualization engine (hypervisor) that uses Intel Virtualization Technology to speed up Android app emulation on a host machine. HAXM can be installed through the Intel site or from the Android SDK Manager. Go to Extras and select Intel x86 Emulator Accelerator (HAXM installer) and download the package. Go to your SDK directory > extras > intel > Hardware_Accelerated_Execution_Manager and run the installer. Follow the on-screen instructions. You might need to enable virtualization in your BIOS setup for HAXM to work. If you have Avast, uncheck Enable hardware-assisted virtualization and Enable avast self-defense module in Settings > Troubleshooting. Google I/O is Google's annual developer conference, where they share the latest products and technologies. Google I/O 2016 will be held in Mountain View, California on May 18-20. If you are not attending in person, you can get the I/O experience by watching I/O Live at the website or by attending Google I/O Extended events being organized by Google Developer Groups and other communities worldwide. GDG Philippines is organizing I/O Extended Manila Live-viewing Party which will be in Globe Corporate Showroom, Valero Telepark, No. 111 Valero Street, Makati City. (Map: http://bit.ly/Map-ValeroTelepark) on May 18-19 (08:00 PM of May 18 to 05:00 AM of May 19). Take the awesome opportunity to connect with other local talented developers and watch the keynote and other sessions live. We'll also have a short program before the keynote (more details to be announced soon). If you are interested to join this event, add GDG Philippines in your Google+ circles for updates about this event and our other events. Registration will be opened soon! Have you tried browsing the Android reference pages and tried to use classes only to find out you would need to add some lines to your Gradle dependencies? Sometimes, I do; that's why I developed a Chrome Extension for this. Android Gradle Extension is a Google Chrome extension that adds Gradle dependency to use for Android API class reference pages. Users can then copy the Gradle dependency text and use it in their codes. There is also a button to copy the text to the clipboard automatically. 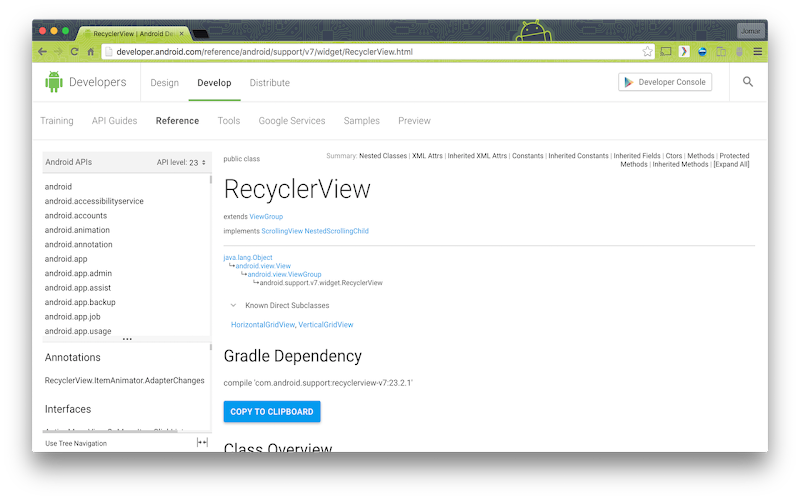 Android Gradle Extension works on class references at developer.android.com. In the future, I'll add reference pages for Google APIs for Android. If you are an Android developer, this Chrome Extension might be useful to you. You can download it now on Chrome Web Store. There might still be some bugs though in the extension. If you find one, please let me know so I can fix it.